30 July 2011. The cat-fight between FoxNews and Gawker appears to be yet another screech in the Obama-CIA's continuing campaign to loudmouth its Bin Laden kill operation of which the orchestrated outing of CIA John is a part. That FoxNews invited Michael Scheuer, the disgraced-and-fired ex-head of the Alec Station-OBL hunting team, to discuss the outing a member of that very same team, indicates that every CIA sly promotional venture is a gloss on the sordid practice of prolonging very drawn-out operations to keep funding flowing generously, Scheuer now a paid shill to do just that. The same practice was at work in the recently completed Aspen Security Conference where the rewards of keeping terrorism media-hot was speechified at length by the prime beneficiaries of the depthless money pit -- national security threat mongerers and the media avidly promoting one another by appearing to differ, the New York Times a funder of the Aspen genteel differences of opinion amongst club members. FoxNews and Gawker gutter-trash-for-ads differs from the CIA and NYT global affairs pretense only in transparency of camouflage. Washington Post today publishes another CIA chapter in the valorization of CIA John, supposedly in response to the Cryptome sniffing, but most likely a sign of appreciation for our taking the bait to promote a designated hero. It glosses the previous AP report by slathering on more motherhood-and-apple-pie "risk to undercover officer," and suggests that ranks of reputable publishers will obediently play the access hand they are given or be banned for revealing the officer's identity. Even threatened with prosecution in the jounralism-hiding-behind-Wikileaks gambit. Nothing about the female star which may mean that will be a separate series of disclosures as the re-election campaign unfolds. A call to the CIA press office might get you a quotable sip from the spigot, and get you placed on a watch list for possible enlistment as a favored outlet. If unusually creatively done you will be invited to interview CIA John and, best of all, the Diana huntress who is pissed that the guy is getting the credit for her deftly brilliant tracking. If unusually creative at stroking you will be invited to interview CIA John and, best of all, the Diana huntress who is pissed that the stud is getting the credit for her deftly brilliant tracking. If the press PR office plays hard to get see the link to the Entertainment Industry Liasion. Cryptome prepared the CIA-John file about 4:00PM on July 5, 2011, uploaded it and the first download took place at 4:11PM. Our copy of the AP story states it was updated at 1:45AM, July 5, 2011. 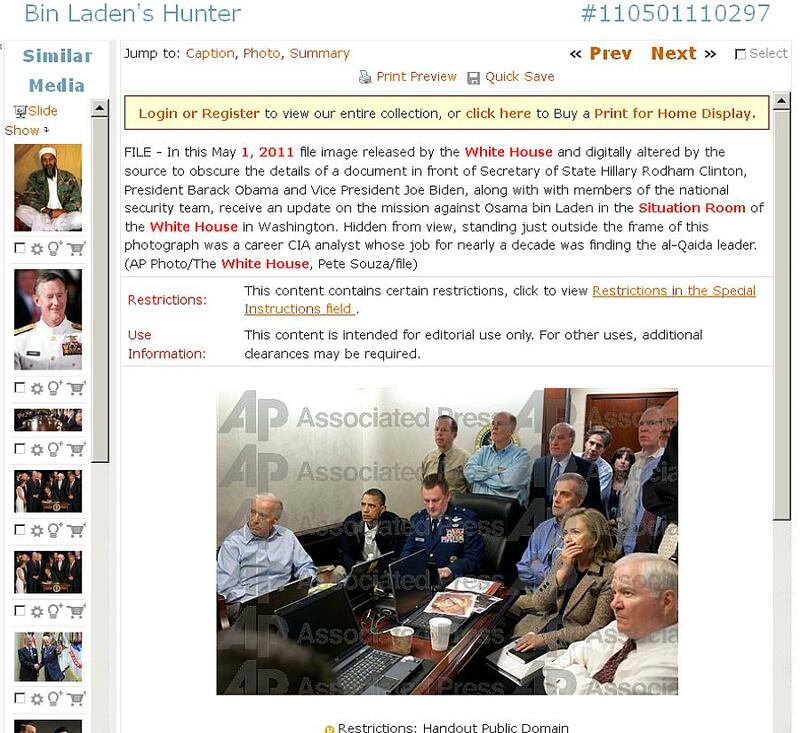 We don't recall exactly when we saw the AP story, but it would have been after 7AM on the 5th when we started reading online news about bin Laden (a topic we are following to track the PR spin). Then it took a couple of hours to look for photos of the days cited in the AP story and package a file (note we package, do not write). Artful cropping by the White House to include John's arm and tie -- and height -- provided perfect clues for dummies to go with the AP dummy-baiting. Fortunately, White House Flickr photos are high-resolution or it would have been difficult to see the tie clearly, and more importantly, to see John in the background in the low-resolution photos customarily appearing in the media. The public may not know that AP and others distribute high-resolution photos to paying customers, and the low-res versions are reduced to hold down costs of publishing. 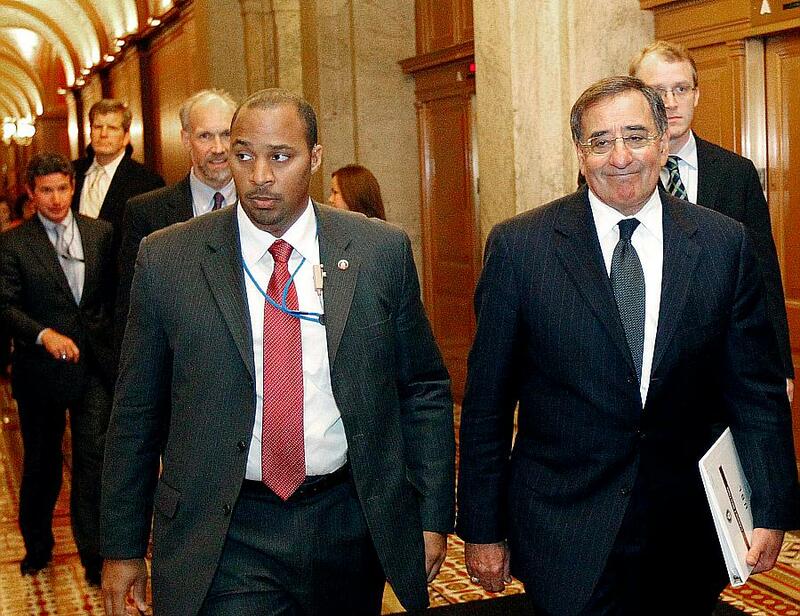 AP offers the Senate photos of Panetta and John at high-resolution at a cost of $200 for a single day's internet use. We did not buy one. Others are free from the White House. Nada from the CIA black hole except to very high-paying customers and syncophants. We assume that by now John and the bin Laden hunt team have been awarded medals. That is likely to have taken place when Obama went to CIA on May 20, 2011, to thank the covert operators in private and the CIA employees in public, the last heavily documented by the press. The next CIA person to be outed on the OBL-hunt team is the woman who worked with John, who made the actual call of a targeted lead to OBL, and, best, AP slyly reports, a journalism graduate! What better story could there be for a spying industry as badly in need of favorable PR for valiant and dogged investigators as official spies. We bet there are a slew of journalists working that clue, and being fed more tidbits and perhaps exclusive briefings by the woman under guidance of CIA PR wizards. If she looks like Valerie Plame we will have most winning couple. Who will get his and her names first, TMZ or you? To sanitize the source send names to Cryptome for washing. 8 July 2011. A relevant Associated Press biographical detail about CIA John's identifying height: "In college, he walked on to a Division I basketball team and hustled his way into a rotation full of scholarship players." 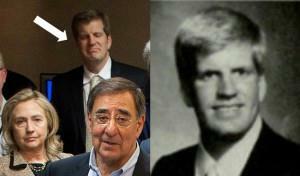 Cryptome: There is little risk to CIA John in suggesting his identity. Spies do not appear in photos unless intentionally, albeit in usually discreet form (every spy spinner rises from the shadows deliberately, maintaining the allure of darkness). 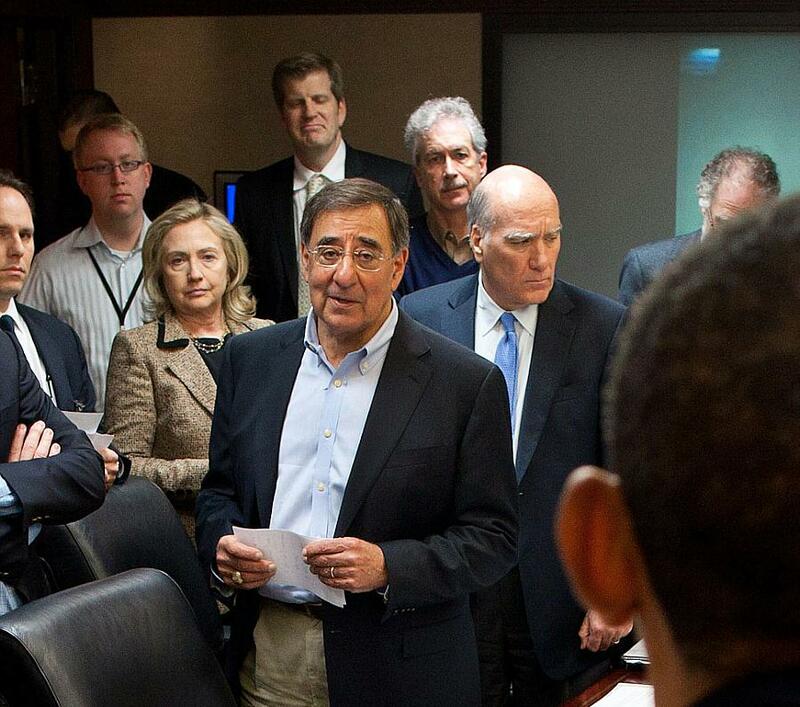 The White House photo where CIA John is in the background appears staged to locate him directly behind Panetta and showing the back of Obama's head. 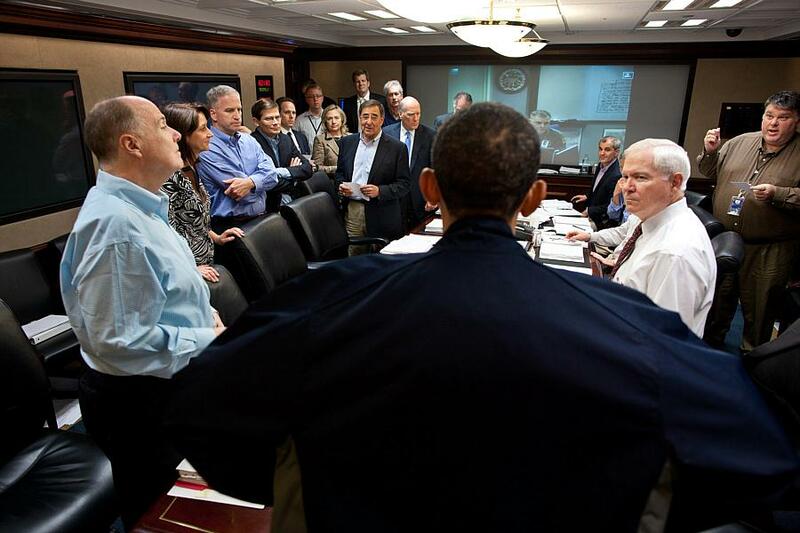 The White House photographer seldom shows Obama in this manner, camera held above Obama (Pete Souza is several inches shorter) to aim at Panetta and his prime briefer of the day. Most likely is that Obama, or his media advisors and the CIA, directed the photo shoot and its publication on Flickr as part of a campaign to vaunt the CIA operation and prepare its media-perfect, tall, handsome, athletic, stolid, dogged, quiet-man dragon-slayer for coming out of the cold for a future public role. Moreover, Obama has emphasized publicity for the CIA and DoD for the OBL assassination, with heavily-media covered visits to the CIA where dozens of CIA employees were photographed and videotaped. The White House offers a video of a visit on May 20, 2011 to thank CIA employees for the OBL operation. 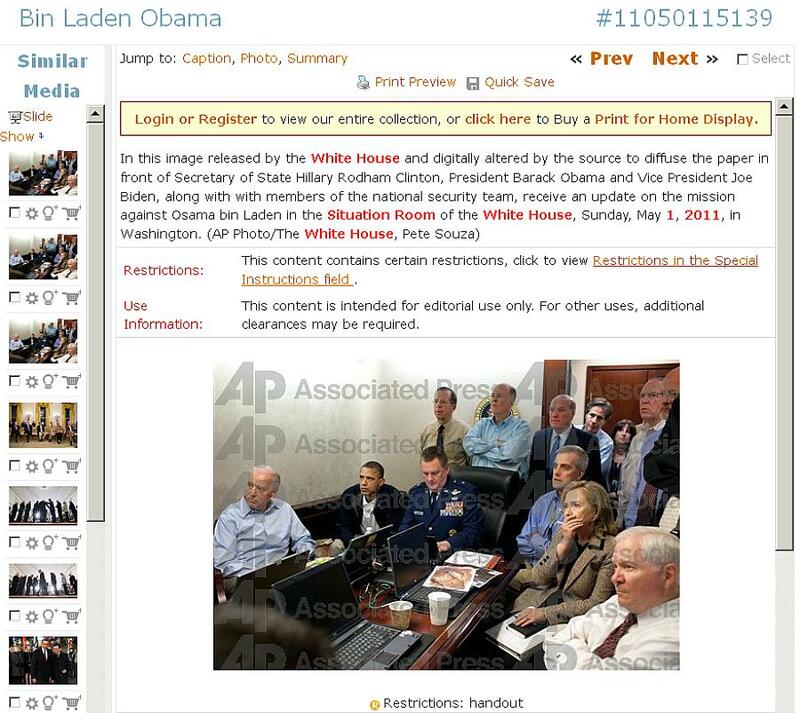 Cryptome offers photographs of that visit and another on April 20, 2009. The two AP reporters who wrote the article about CIA John work the CIA beat, and will no doubt continue their OBL series in cooperation with the CIA -- the agency carefully cultivates such beat reporters with significant disclosures once it is shown the reports will be favorable. It is no secret that there are a bevy of such reporters, writers, media producers, lecturers, consultants and spy-industry friends who capitalize on their privileged access (most pretending to be distant from their bedfellows). John is going to get a career boost, maybe come out of undercover. 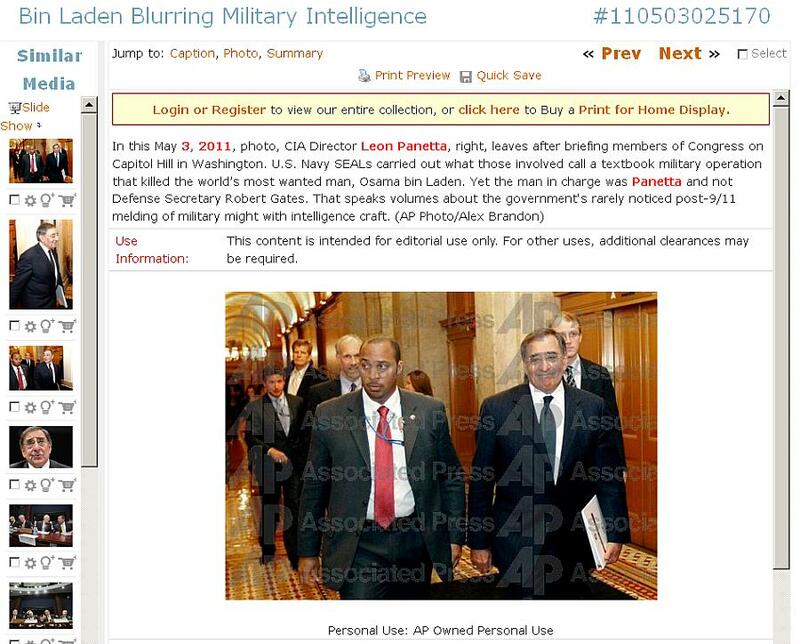 That seems to be what Panetta was doing by promoting him to Obama and then the showboating at Congress knowing the photos would be taken and eventually leaked -- as with the AP story filled with easy to follow clues (AP was told or knew what was in the photos of John in the background). A series of privileged media disclosures is how OBL's killing is going to be promoted by the CIA for many years, with John and Alec Station cohorts moving up the chain of perks and eventually hitting the lecture and literature circuit, first for CIA's never-ending PR and budgetary outreach, then after retirement for hard cash and pension supplements like the crowd of CT natsec gangsters at the Aspen Security Forum. 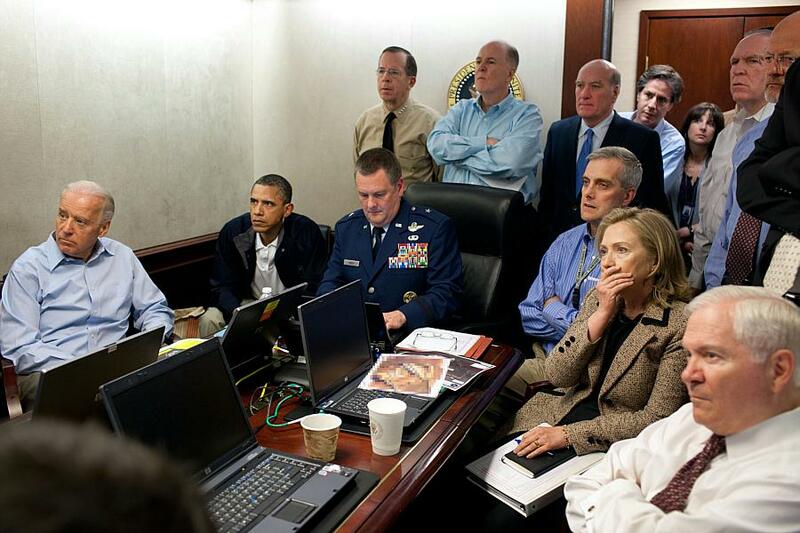 WASHINGTON (AP)  After Navy SEALs killed Osama bin Laden, the White House released a photo of President Barack Obama and his Cabinet inside the Situation Room, watching the daring raid unfold. Associated Press photo offerings. Screen shots downloaded 13 July 2011. The headline and caption for the top image have been updated from the original at bottom.